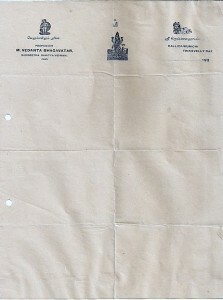 Vedanta Bhagavatar was born in 1878 in Kallidaikurichi. 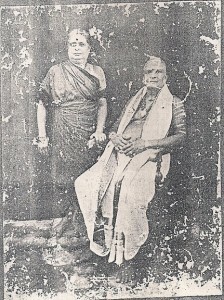 He came of a family of Sanskrit scholars who were attached as teachers of Sanskrit and shastras to the Tiruvadudurai math.His father was Muthu Shastrigal who was holding this respected position in the math.Observing the talent of the young Vedantam the head of the Tiruvadudurai adinam consulted Muthu Shastrigal and placed vedantam and the celebrated nagaswaram artiste Tirumarugal Natesa pillai under Vidwan Melattur Ramaswami Iyer for being brought up as a musician. Vedantam qualified himself not only as a vocalist but also as an early performer of Harikatha.This, he learnt from Tanjavur Krishna Bhagavatar and Tiruppayanam Pancapakesa shastrigal.He gave his first performance at the age of 17 in the Melatheru bhajanai matam in Kallidaikurichi.His family were also traditional shrividya upasakas. He learnt Dikshitar kritis from Subbarama Dikshitar and also Ambi Dikshitar.With Ambi Dikshitar he had come and stayed for some years in Madras to propagate Dikshitar’s kritis by both teaching and publication.He published an edition of the Kamalamba navavarana kritis in the year 1936 with texts,translation and notation. He did the kathakalakshepam the Lalitopakhayna in Tiruvarur.He also came into contact with other famous figures of that time in the musical field, Konerirajapuram Vaidyanatha Iyer and Sarabha Sastrigal with the latter accompanying him on the flute in several Harikatha performances. He specialised in Ragam,Tanam and Pallavi and it is worth noting that at that he prepared and published a book entitled ‘Sangeetha Tatva Pradarshini’ otherwise called ‘Pallavi Parijatam’.His brother Kallidaikurichi Ramalinga Bhagavatar accompanied him in the concerts. He was also a composer and has composed one hundred compositions including a varna in poorvikalyani. It is interesting to see the title ‘sangIta sahitya vidvan’ as printed in his letter head.The media of the songs are sanskrit,telugu and Tamil and the deities are mostly Devi,Subrahamanya and Shiva. He was given the Sangita kalanidhi by the Music Academy in the year 1940.When he presided over the Academy’s conference in 1940, the lakshanas of ragas like saurashtra,arabhi,sama and varali and ahiri were discussed and defined.In his presidential address he emphasised the importance of sahitya and the need for singing the texts of the songs correctly and with the knowledge of the meaning. He took sanyasa in the same year and passed away. 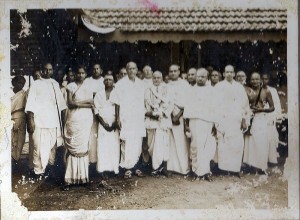 Ramalinga Bhagavatar was a student of Kallidaikurichi Vedanta Bhagavatar. He taught music but did not perform. Navagraha kRtis rendered by Ramalinga Bhagavatar, Student of Vedanta Bhagavatar. Mahadeva Bhagavatar was a student of Vedanta Bhagavatar. Please click on the link above to read an interview with him. Pictures courtesy of Suresh Ramasubramanian and family, Chennai.